Po Ku studied architecture at the University of Dalhousie in Halifax and became a registered architect in the province of Alberta in 1980. An interior designer’s ultimate nightmare is to sign up with a client then later on find out you cannot touch any of the furniture or decorative accessories that the owner has been accumulating for the last thirty years. At the project’s end, you will have to ask permission to move everything out of the place, bring in your own furniture and stuff and have your photographer spend a day shooting the rooms. And then, after the shoot, usually after midnight, you will have to quickly remove your stuff and bring back the owner’s furniture. After that you don’t want to see the place ever again. 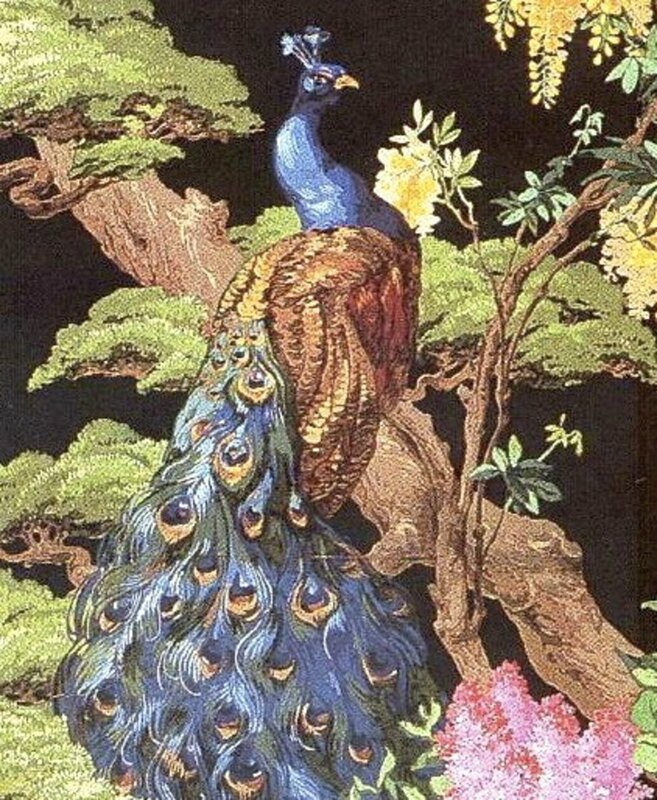 The one godsend client I had was a lady that had been collecting Art Deco pieces for many years. Her house was a mini art gallery. Needless to say the job was one of my most satisfying projects. See image above. I often wonder why people get so attached to furniture and objects bought from big box chain stores and the brand name furniture stores that sell large and bulky furniture mostly made in Asia these days. Interior design is not about buying things to fill up space. Most clients don’t realize, collecting worthwhile furniture and objects can be a hugely profitable undertaking, provided it is done with patience, insight and foresight. My advice to my clients, whether or not it is heeded, is to get rid of the bulky, hard to handle furniture that is not worth anything second hand. Big bulky couches with sagging springs, tallboys and sideboards with computer-guided cut-out scroll work, fake printed-on inlay and marquetry, etc. You won’t get much money for these pieces but by all means send them to the resale stores – someone will buy them. In a house or an apartment, space is valuable. Why waste it by filling it up with junk? To start collecting, start by doing research. Read up about period styles, designers, makers and auction results. Choose a style that you really like and start buying one or two pieces for collection. Never buy mass-produced products for this purpose. Hand-made Scandinavian furniture from the 50s and 60s are hot. Anything designed by famous architects and designers that is not mass-produced is worth collecting. 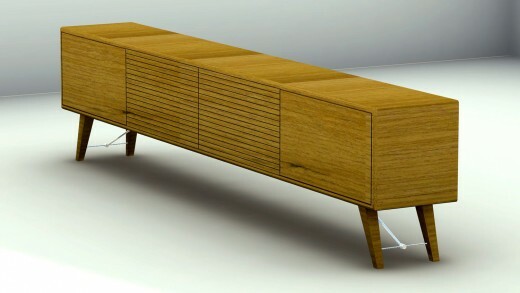 Below is a picture of a mid-century modern teak sideboard. 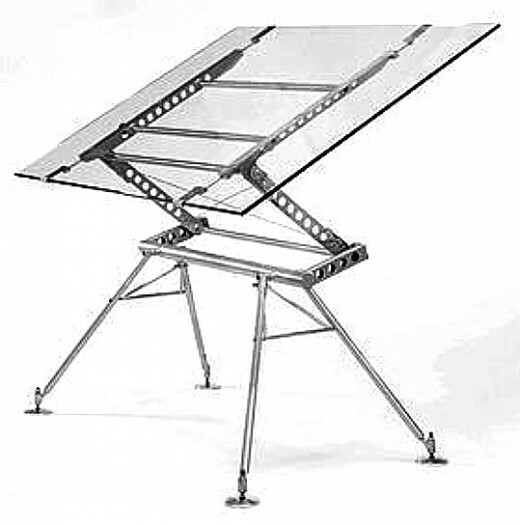 Since architects have been using the computer to draw since the 1990s, drafting tables are for landfills. 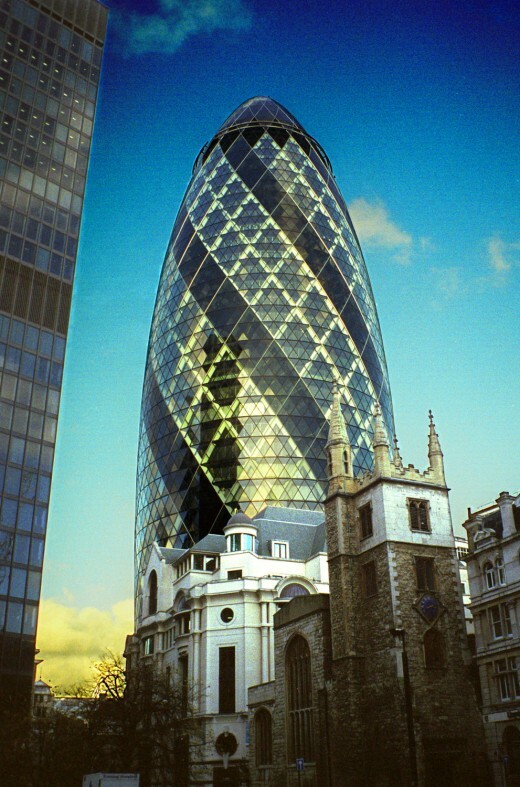 Norman Foster (see the London Gherkin on the right) designed a nifty Tecno Nomos drafting table in 1987 that was a high-tech marvel. You can pick one up from an auction for about US$10,000. This is a great conversation piece. 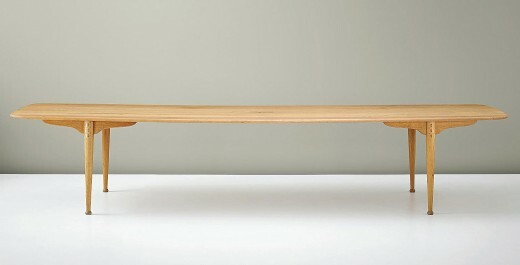 Since the height is adjustable, you can use it as a dining table or display console. You may even want to draw on it. Postmodern master Ettore Sottsass and his Memphis cohorts designed a large number of limited edition or one-off pieces that are going wild in the auction houses year after year. 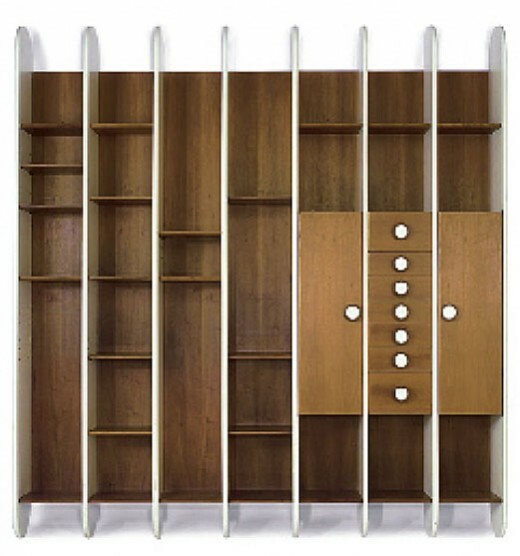 Auction Result : Christie's London, Price Realised GBP 60,000, USD 78,000, Ettore Sottsass, Library, 1965, Wall-Hung, Lacquered Wood and Walnut with Brass, with Adjustable shelves, together with copies of the original receipt and construction plans, both dated 1965, 102-1/2 in. high, 96 in. wide, 12-3/4 in. deep, 4 May 2007. Shiro Kuramata, a prolific Japanese designer of furniture, interiors and objects, died in 1991. He was probably the most well-known product designer outside of Japan in the 1980s. 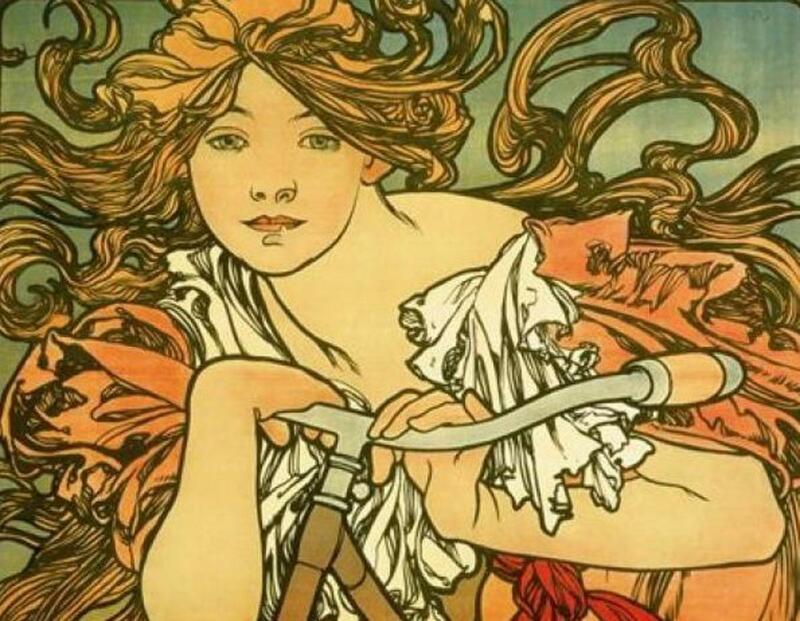 The year before he died, France awarded him the Ordre des Arts et des Lettres. He maintained a design office in Paris then. The picture to the right is his well-known salt & pepper shaker set. His design set the record for the highest price paid for a 27 year old piece of furniture. 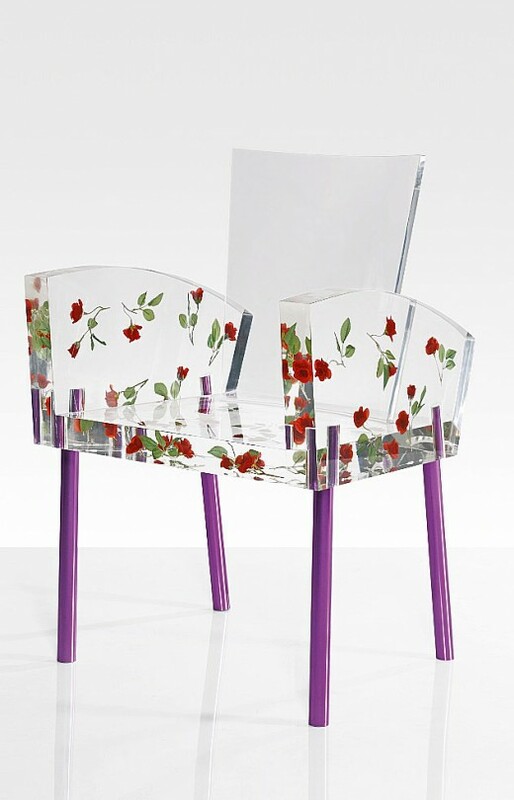 Auction Result : Sotheby's London, Price Realised GBP 269,000, USD 350,748, Shiro Kuramata, Miss Blanche Chair, Designed 1988, Executed 1989, Produced by Ishimaru Co. Ltd., acrylic, artificial roses, anodised aluminium, from the edition of 56, 92H x 63W x 61D cm., 04 November 2015, 2:00PM GMT London. 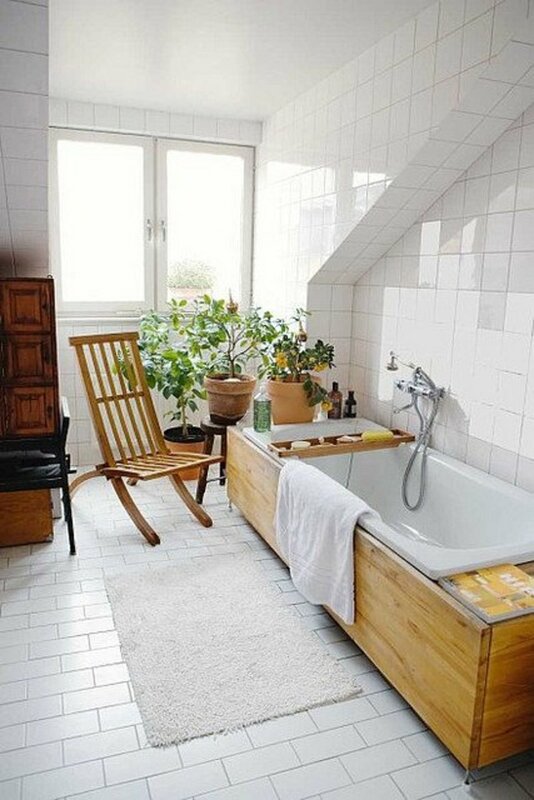 Peder Moos (1906 – 1991) was a Danish furniture maker who made all the furniture himself. Last year, his 12 foot long dining table fetched US$783,000 in a Phillips auction in London. Auction result : Phillips London, Price Realised GBP 602,500, USD 785,600, Peder Moos, Unique Dining Table, Designed for the Villa Aubertin, Rosnaes, Nakskov Fjord, 1952, Oak, Maple, 72.7 x 379.8 x 98.6 cm, executed by cabinetmaker Peder Moos, Denmark, auction date 1 October 2015. Mid Century Modern Glass is another hot topic. Nothing expresses the euphoria, freedom, kitsch and avant-garde spirit of the 1950s better than the glass art of that period. 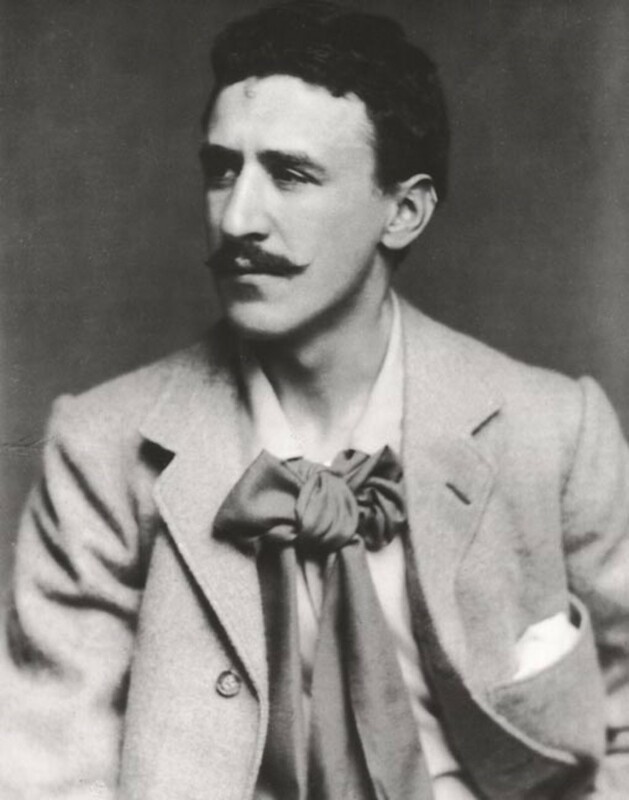 Ercole Barovier, Murano glass artist extraordinaire, leads the pack although he’s been dead for forty years. Many of his pieces look like souvenirs that tourists swoop up in Italy. But his artistic work is brilliant. 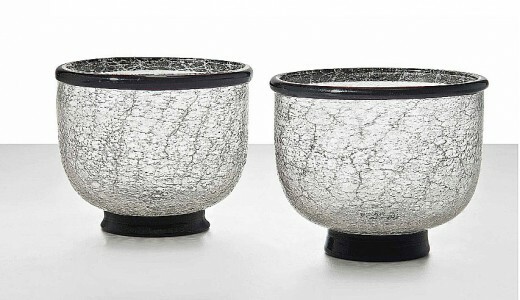 Auction Result : Christie's London, Price Realised GBP 40,000, USD 52,156, Ercole Barovier, Two Primavera Bowls, 1929-30, executed by Vetreria Artistica Barovier, Primavera Glass with applied rim and foot of deep amethyst, each 3-1/2 in. high, Auction Date 4 November 2014. Angelo Barovier, son of Ercole, died in 2008. His work was more architectural with a minimalist Art Deco sensibility and somewhat more affordable (for now). Auction Result : Wright NY, Price Realised USD 6,250, Angelo Barovier, A Canne Bottles with Stoppers, Pair, Italy, 1958, Polichrome Glass Canes, 5-1/4 w x 3 d x 10-1/2 h, Auction Date 13 June 2015. The picture below is a bowl designed by Angelo Barovier. You may think that everything worth collecting is already too overpriced. Not so. You can start collecting any time. But you must have a sharp nose for rare and precious designs that will eventually skyrocket in price once demand reaches a critical point. It doesn’t hurt to flip through old magazines to find the designer whose work you like and then search on line to see if the designer is still alive and how much his/her work is fetching in the auction markets. Sometimes, a designer piece can go for fairly cheap in the European auction houses and catapult in value in the London and New York markets. The buyers have difference taste, likes and dislikes in different countries. 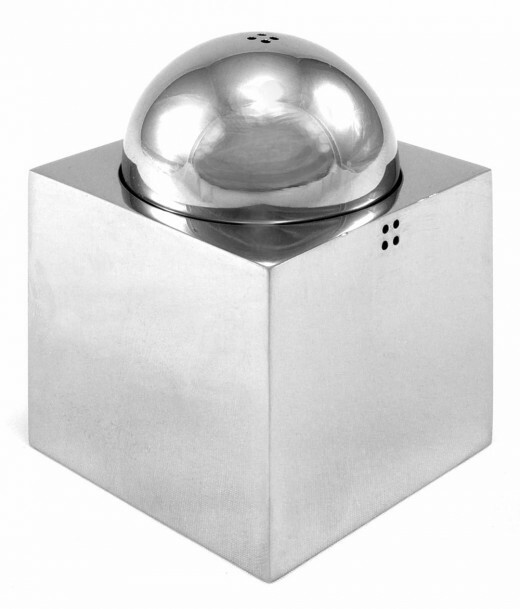 For example, one can generally pick up Sottsass cheaper in Europe than in New York and LA. 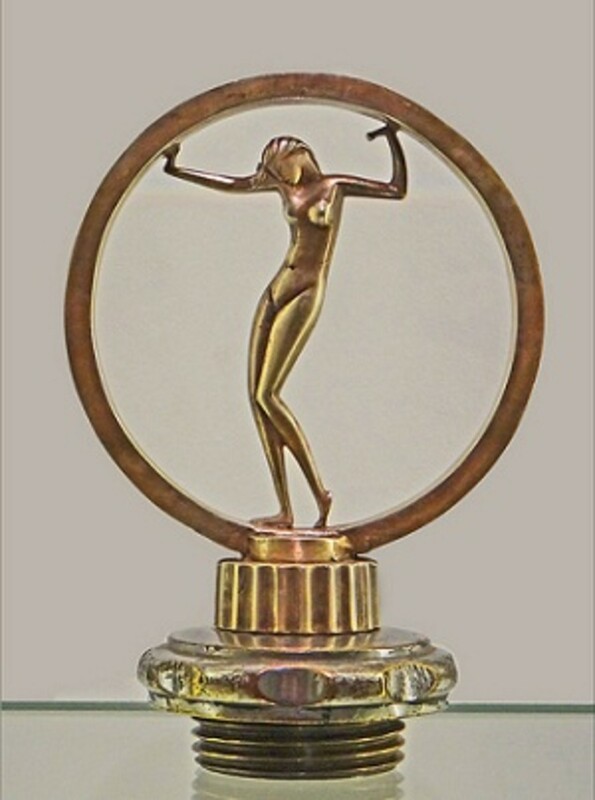 Frecnh Art Deco furniture generally fetches higher prices in France and England than in the U.S. They have designed furniture and objects for manufacturers in Europe and the U.S. I choose them because their work is truly beautiful. Their style may not be in vogue but their time will come, sooner or later. 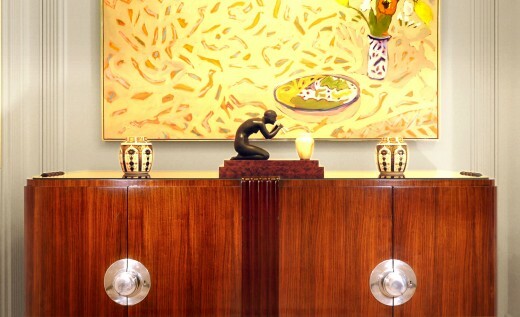 In any case, collecting 20th century modern designs as investment is a hit and miss endeavor. Make sure you really love the piece you have decided to invest in. Then owning it and putting it in one of your favorite projects will make it all worthwhile.